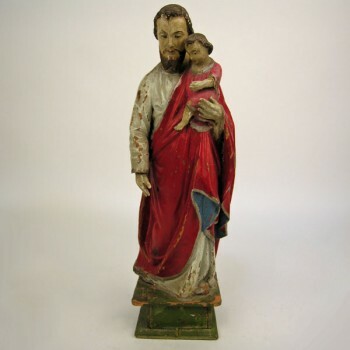 Polychrome painted wood carved figure of Saint Joseph holding the Santo Nino, (Christ child). Beautifully robed and acquired in French Christian Hanoi, Vietnam. Early 20th century. Measures 18" tall x 5" wide " x 6" deep.